My recent travels took me to one of Europe’s most trendy design cities – Stockholm. The homeland to the one of the biggest furniture retailers – IKEA, this trip helped me to gain insight into the principles of Nordic design and why it’s so popular. Ikea’s main success boils down to their key vision: To provide a better everyday life for the many people through their products. I soon discover Ikea’s vision flows through to all Nordic design products. Scandinavia obviously has a particular flair for affordable, functional furniture made using traditional craftsmanship. Lucky for us Nordic design is finding its way back into our living rooms. When you stick with Nordic Furniture your guaranteed more bang for your buck as 9 times out of 10 it will be made with great quality using natural materials. Design fans are as excited about the scene today as they were when the classic egg chair first rolled off the production line 57 years ago. In February this year, more than 40,000 people visited the Stockholm Furniture Fair. This growing interest is partly due to big-name brands rejuvenating their product lines, pushing the possibilities of materials and technology, forming creative collaborations and reinterpreting their heritage for a contemporary audience. If you are just as excited about Nordic design making a comeback here are some clever design ideas get a touch of that Nordic feeling into your home. Stockholm is surrounded by water so it’s only natural for Scandinavian homes to lean towards blue as they’re favourite hue choice. A good way to introduce pops of blue is through soft furnishings and accessories such as cushions, throws, and vases. Blues look great paired with light timber flooring or white washed floors, which creates a calm and stylish effect. 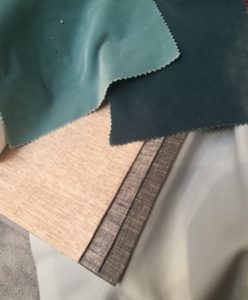 Velvet is generally opulent and a statement piece, but it can be paired back in a Scandinavian home by using grey velvet for a sofa or accessories with just a bright pop of colour in cushions. Velvet layers up perfectly with linen as bedding or curtains and shows off it’s versatility as a fabric in so many different settings. Perfect for any season we can’t stop crushing over these classic, cozy and tactile fabrics. 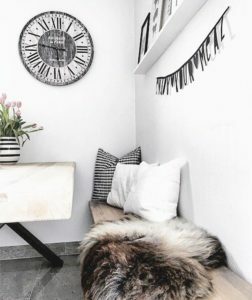 A sheepskin rug is versatile, comfortable and uber chic. The fluffy white fur is an ideal accent for the Nordic style and works well against wood and white. If you’re looking to add some stylish texture to your room, nothing gets the job done faster than draping a fur (or faux fur) over the couch. With its quiet, understated aesthetic this moody shade is the tone shade of the moment. To stick with the Nordic feel choose a grey with cooler blue tones in it, an icy touch that works with whites and pale woods. Nice refreshing change from the go to black and white scheme. Proving everything old is new again; wood clad walls are enjoying a renaissance, but thankfully in a more contemporary manner. 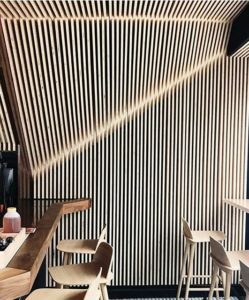 Pale, smooth woods line Scandinavian style and Zen-like minimalist interiors, and reclaimed timber has become the fashionable material of feature walls. Bring that vacation home with you by enjoying a spa-style interior in your room. With all these chic ideas you can’t go wrong adding that Nordic style into your home! If you want to learn more about the Scandinavian style, please contact the Inspired Spaces team.